Over the past few years I have tried all the other vests, vests with bags of shot, solid iron and lead bars or plates. None of these vest are safe or comfortable. They ride up and hit you in the face. I do a lot of floor work with my clients, you can not do floor work with vests with plates, shot, bag, or bars without hurting yourself. I have used Ironwear's Uni-Vest for years, I have bought enough so that I can have weight vest classes. The Flex-Metal weights are great. For the past year I have been using Ironwear's Speed Vest. This vest is unlike any other vest. 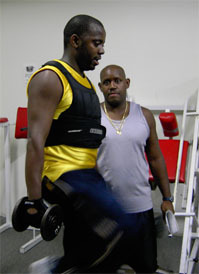 From the moment I tried it I knew this vest would change how I trained my athletes. It fits my young under 100lb athletes to my 300lb football players. It fits like a glove on men and women alike. This vest doesn't move, you can run, play basketball, do drills without a problem, plus its cool. The air flows right through it so you don't heat up like all the other vests. Another Ironwear product I love is Ironwear's Shoe Irons. These fit comfortably over your shoes and don't go anywhere. I personally play basketball and run 2 to 5 miles in mine a couple times a week for my own training. I train a lot of young athletes; explosive speed is the key. I use the Speed Vest and the Shoe Irons to give them the edge and get them ready for high school, college, and pro tryouts. Ironwear products have really helped my athletes perform better. In the classes I teach I have created the "terminator" workout. I have all the men and women in class wear the Uni-vest, Uni-pants, Shoe-irons and Hand Irons. The clients and athletes love it. They can't wait to see what is coming next. Now that I've become an Ironwear Trainer things are even better. When I train someone with a vest, shoe iron, or uni pant they often want to buy their own. Now I carry extras and sell them what they need. I have been selling to different track, basketball, and football teams that I work with.